Ready for some more button mania?? 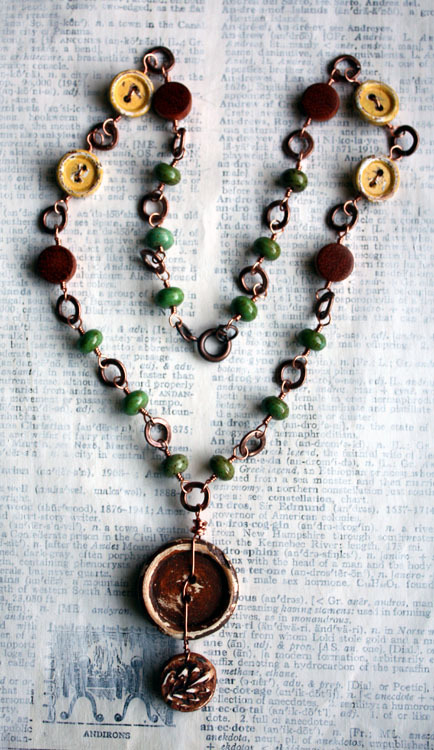 I've had several people inquire in the comments about how to incorporate buttons in to jewelry pieces. 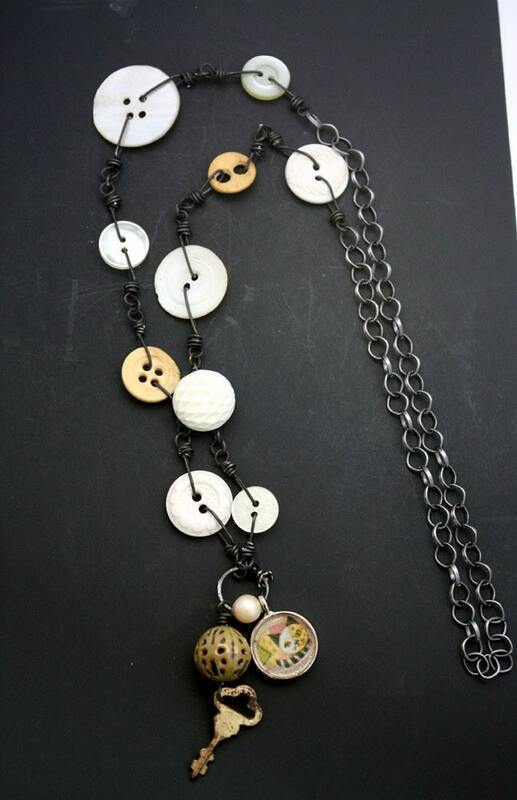 I figured I'a share some of my own items that include buttons in various ways, as well as one from another designer. 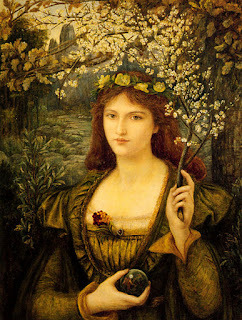 As such, this post is a little picture heavy. 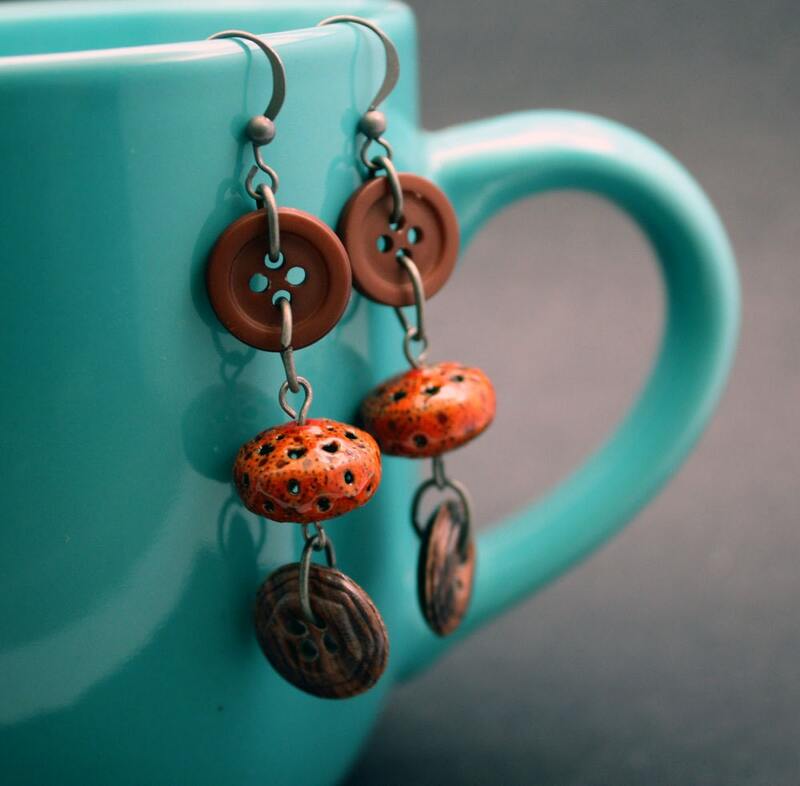 First is a pair of earrings in which the buttons are simply joined to an enameled bead via jump rings. 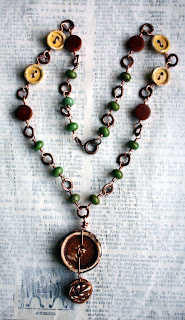 Here's another example of a button connected with jump rings; this time as part of a focal in a necklace. Very small buttons can be included in a resin bezel. Knotting a button on one end of a length of cord, leather, fiber, etc. 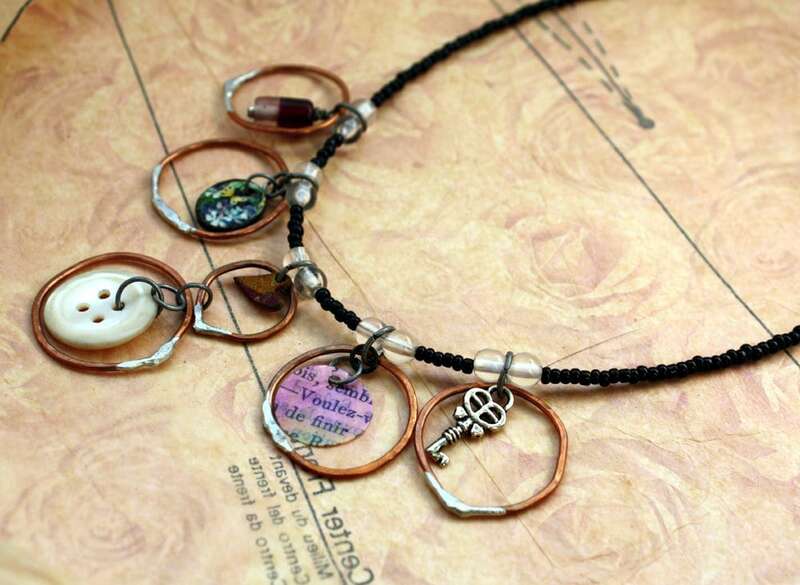 and creating a loop at the other end makes the perfect clasp like in this necklace. 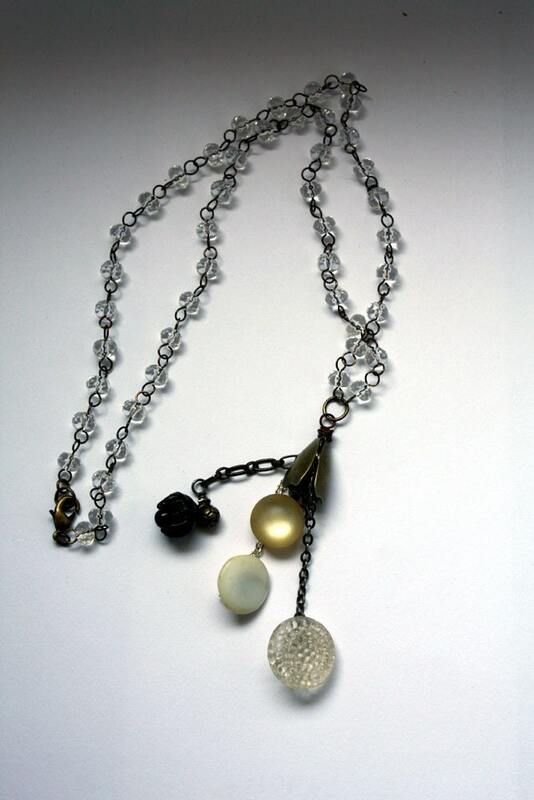 Shank buttons (those with a loop in the back as opposed to holes) can easily be wire wrapped to hang as dangles. 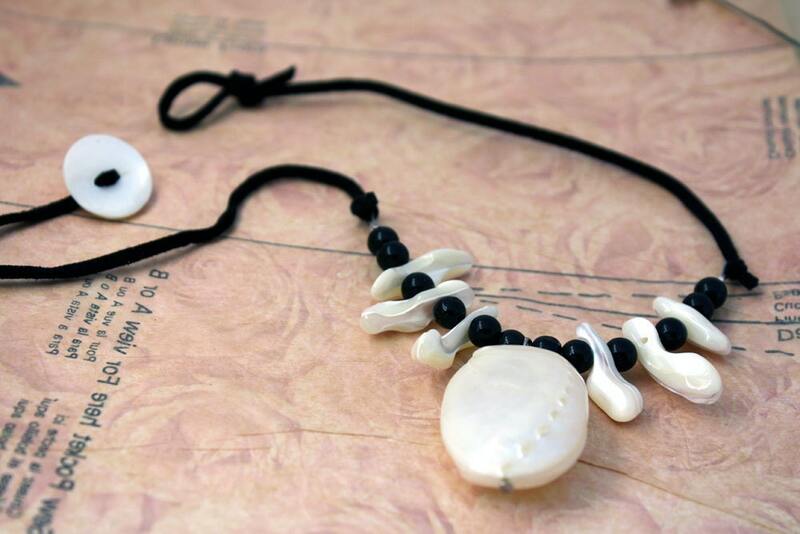 Or even just added in with other beads as part of the necklace. I'm not the only one who likes to use buttons either. 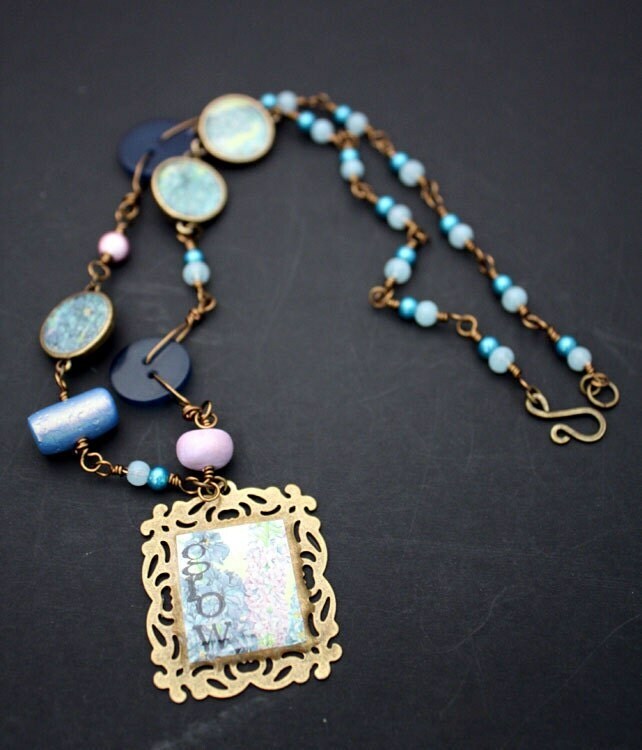 The famed Lorelei Eurto just listed this beautiful necklace in her Etsy Shop that incorporates buttons as part of her necklace. The inspiration for this piece came about by accident. As I was correcting the ugly-ness of that button, I realized that it went perfectly with the little leaf gift charm Heather had included with another charm I ordered from her. Looking at the charm and button together reminded me of the color palette for the inspiration piece. I quickly got to work making some more shabby beads in the warm, mustardy-yellow in the palette. Before I knew it, this necklace was all together! Check out some of the other beautiful pieces in the ABS Monthly Challenge Flickr Group. 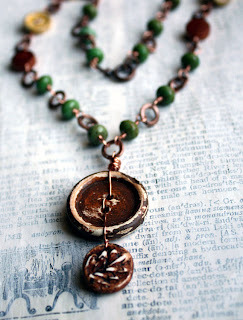 Lastly, I relisted a necklace today that also includes buttons in the chain as well as in the focal. 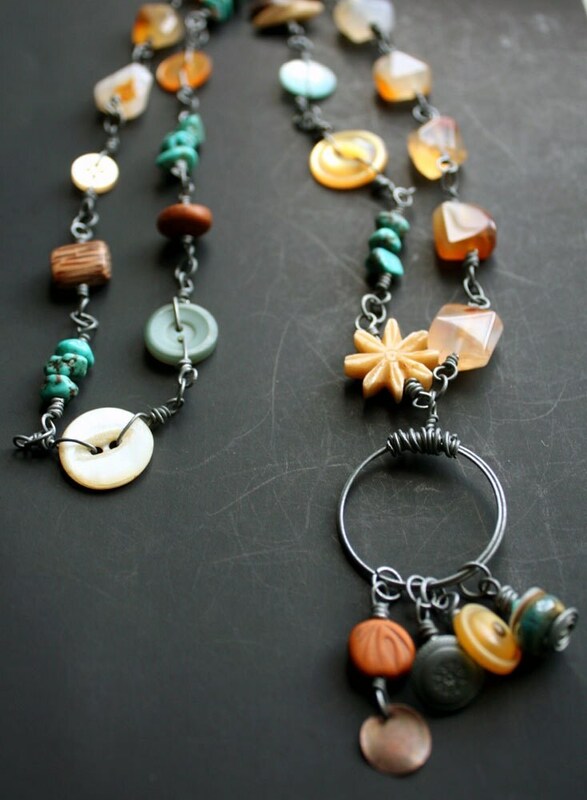 So that's just SOME of the ways that buttons can be used in jewelry. 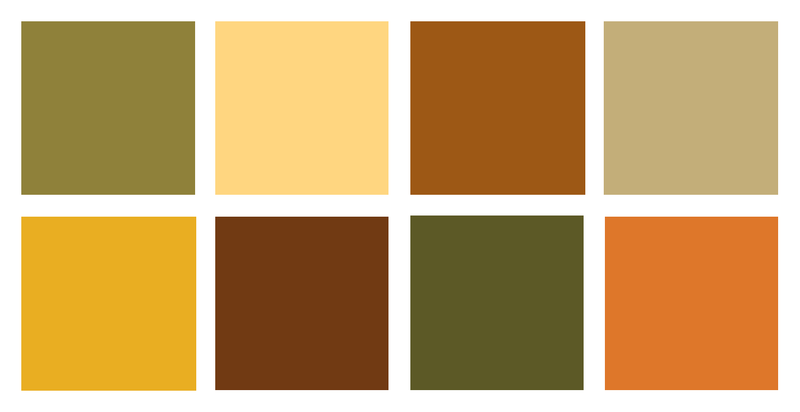 I've got another few designs that I'm working with which incorporate buttons. I may share them at another time. If you've found or developed some interesting ways in which to use them, please feel free to link to or explain your ideas in the comments. I'd love to hear what you've got up your sleeve. I like using the occasional button myself. 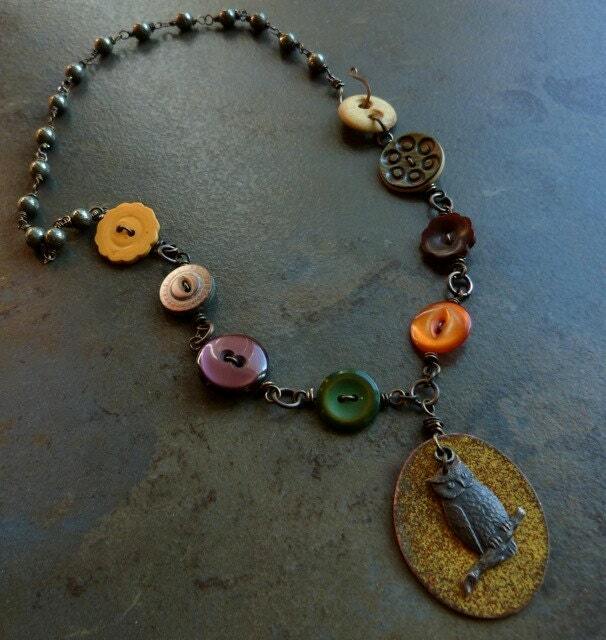 Your "ugly button" works perfectly with Heather's charm! I curse myself regularly for not taking ALL of my grandmother's buttons when she offered them to me years ago. I just took the ones I liked at the time, when my tastes were a lot less broad. They wound up at Goodwill or something I'm sure. I'm a big button fan and love all of your examples! 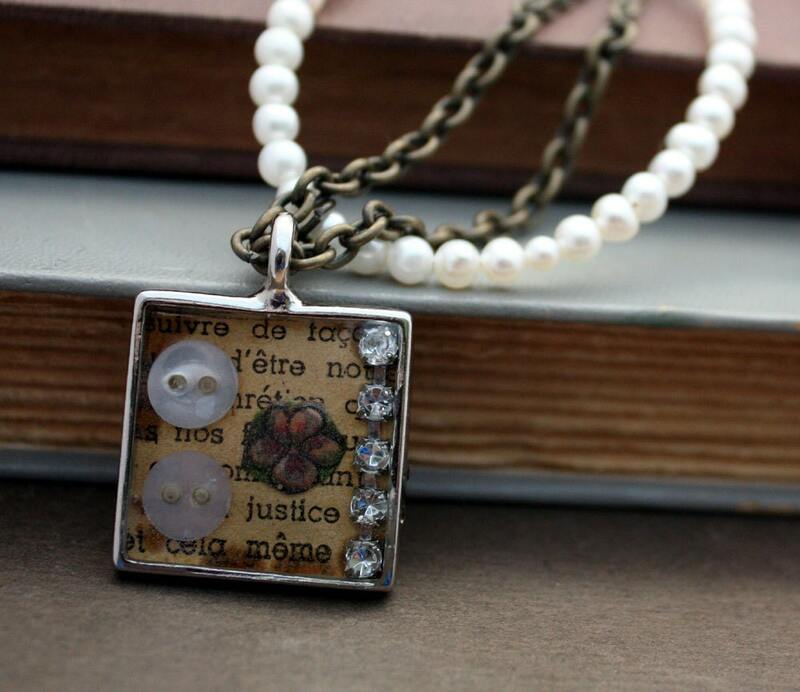 Hope - your Laughter Falls Necklace is gorgeous. Fun and casual... Love your interpretation of the ABS piece this month, too. Hope I just absolutely love your creativity. I really like the necklace that you did for the ABS challenge. The Bubbles Necklace is awesome! Is it on your Etsy? I love all of these examples! I haven't used buttons in my jewelry, and you are inspiring me to give it a try! I am working on earrings today...perhaps I shall raid my button stash! Beautiful work, Hope! Oh I love your button transformation!!! The last 2 necklaces are my favs - love all the tiny treasures!